The uniquely chic style of ostrich leather can be yours, thanks to our faux ostrich menu covers. When you present these striking menu covers to customers, their dining experience will instantly be enhanced. 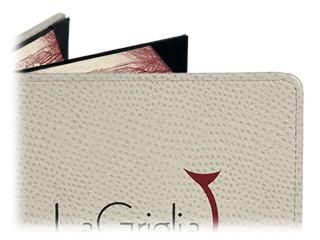 Our faux ostrich menu covers look and feel just like genuine ostrich leather. Their actual material is an extra thick polyurethane that is several times stronger and more long-lasting than similar materials like vinyl. Each cover is smoothly bonded to a thick foam board interior and a carefully woven backing. It can also be made without padding. Inside lining and corners are made from imitation leather in a complementary color. When you invest in a faux ostrich menu covers, you are crafting a unique dining experience your customers will remember. 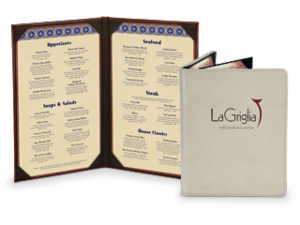 You can customize every element of your menu cover, including the edge trim, color, size, and front design. 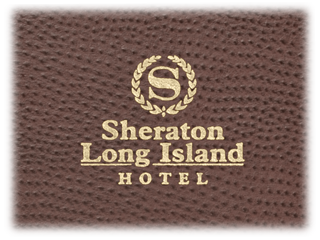 Your logo or restaurant name can be prominently displayed on the cover or within a cutout, picture frame window. Choose between square or round corners, with or without stitching around the edges. 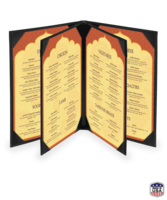 Each menu cover includes sturdy tabs that allow you to easily insert your menu sheet into place. 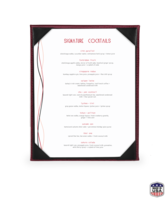 If you want your restaurant to have a unique, high-end style, then faux ostrich menu covers are a perfect choice. You can find faux ostrich menu covers at many seafood or steakhouse restaurants. However, don’t let your choices be limited! Due to their versatility, they can also be used for restaurants of many types. With a typical lifespan of at least five years, the durability of your faux ostrich menu covers will never be a concern. The polyurethane material is laminated to a woven backing for outstanding folding and wear durability. They are specifically designed to withstand the stress of a restaurant environment including messy food, spilled drinks, hot dishes, and frequent handling. Cleaning your faux ostrich menu covers is quick and easy. All you need to do is wipe each menu cover down with a damp, soapy cloth, and then dry it with a dry cloth. You shouldn't have to design your menu's size to accommodate your menu cover. 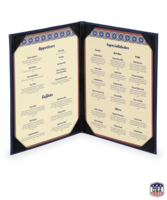 We can make the menu cover to fit the ideal size of your printed menu by providing you with a variety of size options as well as any custom size you might require. Also choose from a selection of booklet-style designs including: single, double, four-view, and six-view pages. 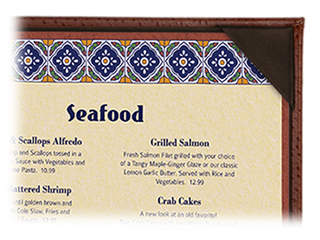 Whether your restaurant's color scheme is bold or reserved, we can provide a faux ostrich menu cover to match it. We provide you with over ten color options including rich mahogany and cobalt blue. Midrange to high class. Faux ostrich provides the full benefit of ostrich leather's unique elegance without the high cost or maintenance. Instead, you can pay a lower price for the same look and feel. Your restaurant has a unique atmosphere, and your patrons should feel this energy in every moment of their dining experience. 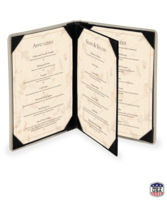 Faux ostrich covers provide you with an exquisite menu you can be proud to hand your customers. If you want a unique look for your leather menu covers, try our faux ostrich menu covers that exudes the same luxury yet offers a different style.